34201 3 weeks ago Michael James New York, NY , US this would add a massive and unecessary debt. 34199 3 weeks ago Mark Haney Pinellas Park, FL , US Turkey is not a reliable ally. 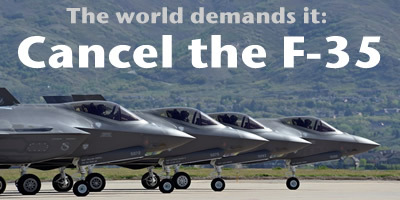 Cancel F35 contract and deliveries to Turkey. Provide refund on two planes delivered in the US for training. 34195 4 weeks ago Ron Padilla Santa Rosa, CA , US Re-direct the engineers that work for Aero-Space-Defense industry to work on Earth based solutions that will benefit us all and not the weapons industry. 34194 4 weeks ago Brett Anderson Wheat Ridge, CO , US War never has been and never will be an answer. It is a tool of the rich to kill the poor. 34193 4 weeks ago Anonymous Medford, MA , US Build schools and help homeless. Not over-priced this wasteful military spending. Cut the military budget! 34184 1 month ago Diane Dubuque Fairfax, VT , US Darn straight, they want it 20 miles from my home, we do not want them!!!!!!!!!!!!!!!!!!!!!!!!!!!!!!!!!!!!!!!!!!!!! !